This artist's interpretation shows the area surrounding the Huygens landing site on Saturn's moon, Titan, based on images and data returned by the probe on Jan. 14, 2005. Ten years ago today (Jan. 14), humanity got its first up-close look at a bizarre, frigid moon that may be capable of supporting life as we know it. 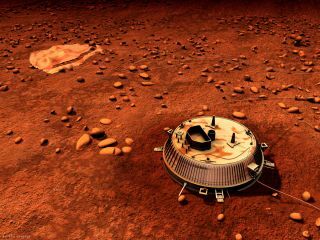 The European Space Agency's (ESA) Huygens probe touched down on the surface of Saturn's huge moon Titan on Jan. 14, 2005, three weeks after being deployed from its mothership, NASA's Cassini spacecraft. For the first time ever, an emissary from Earth had landed softly on a world in the outer solar system. This series of images was taken by the European Space Agency's Huygens probe as it descended to the surface of Saturn’s smoggy moon Titan on Jan. 14, 2005. Cassini reached the Saturn system in July 2004 and thus had already observed Titan by the time Huygens touched down. But the lander beamed home information impossible to obtain from afar, a data haul that began during Huygens' two-and-a-half-hour descent through the moon's thick atmosphere. "The images taken by the falling probe and released to the public that night were everything our images from orbit were not: unfiltered, exquisitely detailed views of the moon's surface and unambiguous in their account," Porco wrote. Those images revealed what appeared to be a shoreline, as well as snaking channels that had obviously been carved by flowing liquid, she added. But that liquid was not water; Titan has a hydrocarbon-based weather system. The European Space Agency's Huygens lander returned this image from the surface of Saturn's moon Titan on Jan. 14, 2005. "It was circumstantial but incontrovertible evidence for the liquid hydrocarbons that we had strained from orbit to find, and thrilling beyond measure," Porco wrote. "It was soon to be followed, after landing, by another unforgettable sight, under a cloudy sky and across a cobble-strewn ground to the moon's horizon in the distance." Huygens kept sending data to Earth from Titan's freezing surface for 72 minutes before its batteries died and the probe went dark. The lander's measurements and observations helped lift the veil of mystery that had enshrouded Titan. For example, Huygens took a detailed profile of Titan's nitrogen-dominated atmosphere, gathering temperature, pressure and density readings over a wide range of altitudes. You can read more about Huygens' discoveries here, in a top 10 list ESA compiled to commemorate today's anniversary. While Huygens ceased operations shortly after touching down on Titan, Cassini has continued to study the huge moon (along with Saturn itself, and many of its other moons). For example, over the course of more than 100 flybys, Cassini has mapped much of Titan's surface and, using radar, probed the depth of some of the moon's biggest hydrocarbon seas. Moreover, gravity measurements by Cassini suggest that Titan harbors a subsurface ocean of liquid water, NASA officials said. The $3.2 billion Cassini-Huygens mission — a joint effort of NASA, ESA and the Italian Space Agency — launched in 1997. The Cassini spacecraft is scheduled to keep making observations through September 2017, when the orbiter will end its life with an intentional death dive into the ringed planet's thick atmosphere.